I happened upon the Growing Up Heroes tumblr in my internet travels whilst in the process of digitizing a big ‘ol box of family photos. The design is a little rough, but it’s a great concept: user-submitted photos of childhood superhero costumes. Anyway, I submitted all of the ‘hero-centric’ halloween shots I had, and they posted two of them today (One, Two). 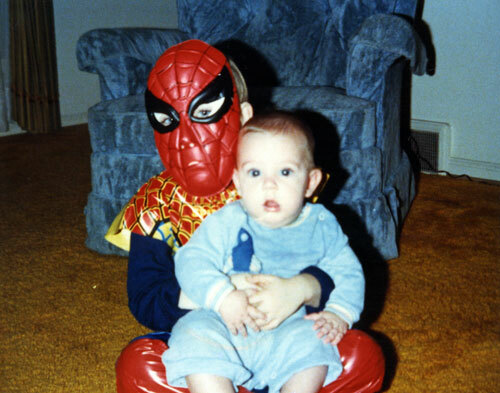 One from 1985 featuring yours truly as Spiderman and my brother Chris as a one-year old, and another from 1987, with my brother and I wearing Captain America and Flash costumes hand-made by my mother. Nerd alert! Fiona Apple and Jon Brion cover Billie Holiday as a part of a Haiti benefit at Largo. I would buy an album of recordings like this. 90’s surf rock giants Man… or astroman? to reunite. Key: Original lineup, which I only got to see once, at St. Andrew's Hall in Detroit. "It was not atypical for Man or Astro-Man? to arrive at a club, set up for 5 hours, play a show as hard as you possibly could, break down for 3 hours and talk to everyone until the last kid left, drive to the next city overnight, wake up at 10:00 AM and do some fanzine interview, play on the local college radio station shortly after lunch, then do an in-store thing at 4, go to the club and set up, then (if the club was over 21) do a short 20 minute full stage show for underage kids when the clubs would be closed during our soundcheck, and then finally play our full show again and repeat the process the next day. We thought that was what every band did." Design for chess pieces in which their top-down view serves as a diagram for legal moves. I love this idea, but I'm not particularly informed on the comings and goings of the chess world, so I have no idea if this is something that's been done before. I think the king and pawn designs could use a little tinkering… this would be a great assignment to put in front of industrial design students. This ad is one in a series called ‘One More Reason,’ in which Ford owners are interviewed about their favorite features of various Ford cars and trucks. In summary: I turned 30 and immediately started selling out to car companies. Just kidding. My last three cars have been Fords, and just recently I had a great customer service experience with them. I’m actually weirdly into the idea that Ford was the company that we ended up in an ad for. Pixar animator Angus MacLane’s ‘Cubedudes’ – Lego likenesses of pop culture characters. Something for nerds of all stripes. 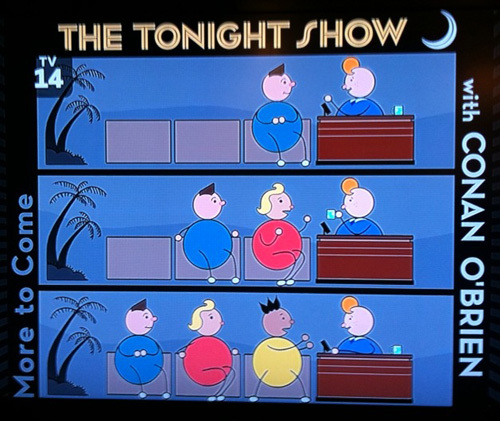 One of the pieces of ‘bumper’ art on tonight’s episode of Conan’s Tonight Show was the piece below, expertly echoing the ‘circular shorthand’ style that Chris Ware has used in a number of strips and in two animated shorts for the ‘This American Life’ TV show. There is a long history of Conan’s bumper art paying homage to disparate pieces of visual inspiration. Awhile back, there was a great website collecting all of these homage images here, but it looks like it’s fallen off the web. In a Metafilter discussion of that site, the name Kevin Frank is floated as the mastermind of all this, and following up on that lead brought me to his Flickr account, which has a gallery of all the bumpers with commentary. In case any are missing there, it looks like the content from the first site is also up here. The internet. An homage to Ware’s work previously surfaced in the background to a piece of Conan’s bumper art in November of 2005. 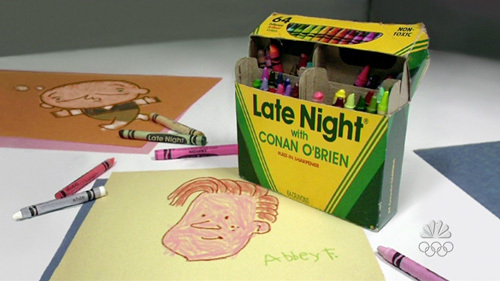 If you don’t see it, Ware’s Jimmy Corrigan is the ‘Non-Conan’ drawing. Thanks to Ted Miller for originally pointing it out! A great idea perfectly summarized in a narrative sketch. Rosy report on the progress of the Detroit – Ann Arbor light rail project. They claim it'll be running by year's end. I am skeptical, but would *love* to be wrong on this. Gallery 1988’s He-Man inspired art show. The caliber and scope of their themed group shows lately is nuts, and the online promotion is unparalleled: clear, high quality photos of all pieces in the show with prices and up-to-date availability directly beneath. Seems simple; no one does it.